1. 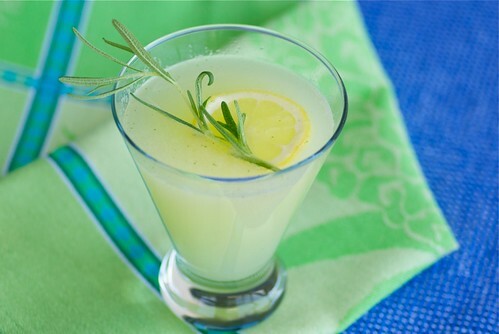 Make a batch of this Sparkling Rosemary-Ginger Lemonade and refrigerate it. Chill a tall glass in the freezer, and fill it with the ginger lemonade. 2. Find a comfy hammock or chaise lounge, preferably in a shady spot. Recline on it while sipping your ginger lemonade. 3. Tell your significant other, your kids, the dog to leave you alone. OK, maybe not the dog. 4. Listen to the hum of bees. Smell the sharp scent of freshly cut grass. Watch the clouds float by. It's a lazy summer day. Make the most of it. 5. 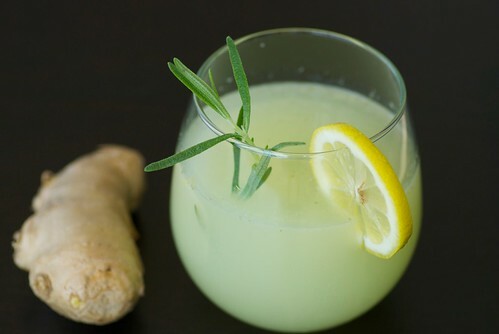 If you're still not relaxed, pour yourself a second glass of ginger lemonade and add a shot of vodka or gin. Repeat steps 2-4. With fresh rosemary, ginger, and a little sugar, this refreshing lemonade is both savory and sweet. The flavors in this lemonade intensify with time, so if you're not serving it right away, you might want to add more sparkling water when you do serve it. 1. Combine ginger, lemons, sugar, rosemary, and water in a blender. Puree until well blended and no clumps remains. Pour through a sieve into a bowl, using the back of a spoon to squeeze the lemon mixture and extract all the juice. Pour into a pitcher with 3 cups sparkling water and lots of ice. Garnish servings with a lemon slice and a sprig of rosemary. Serve immediately. If you're not serving it immediately, then omit the ice and chill in the refrigerator. This looks delicious. In my neck of the woods summer is not too far away so I will be needing something like this soon. Thanks. You have no idea how bad I need this... I'd rather have it right now but 5pm will have to wait! This sounds absolutely fantastic! I hope Sunday is warm enough to require a pitcher of these. It's relaxing just thinking about it. I'm ready for this everyday... the kids schools reopened in July, and this is just the cure for frazzled ole me! WOW!! Wow, I need a glass of that right now! Sounds delicious! That sounds delicious. I have a machine to make sparkling water, so I'm on the lookout for ideas! Yum. I've been wondering what else to do with the rosemary in my garden. This sounds delicious. Can't wait to try. I make ginger lime quite frequently but have never added rosemary.. thanks for the neat twist. I'm making this for a cookout I'm having this weekend. The ladies I'm inviting don't drink alcohol so this is perfect. Thanks! I'm surprised - and loving the fact - that this has such little sugar. I bet this would also be nice with a splash of St. Germain! Sounds deliciously fabulous. I love all those flavors. I am starring this for a summer party! This looks too wonderful for words. Thanks for sharing,Im making this one soon!